Here’s a nice article about the technology I worked on last year at the north pole. I will work on it again this year. On the way home we had a layover of a day and a half in Kangerlussuaq. As luck would have it, my roommate there was Dr. Ron Sletten, a university of Washington geochemist. This summer he is supervising a team of scientists who are studying the way that microorganisms interact with the area’s geology. I volunteered my labor for the next day’s field study, and he graciously offered me the opportunity to ride along. The next morning, eight of us filled two pickup trucks with equipment and headed out on one of the handful of roads leading from “Kanger,” as everyone calls it. None of the roads go very far – the only way in or out of Kanger is by air or ship. This is typical of Greenland communities; it is a frontier region, and the only paved roads are within towns. Inhabited regions are separated by vast areas of wilderness. The bumpy dirt road didn’t afford any photographic opportunities, but it offered lots of possibilities: rolling hills, stretches of desert-like sand, wide riverbeds, endless plains of tundra grass and moss, and erosion patterns of every sort. Although we were above the Arctic circle, it was much warmer than Alert – being hundreds of miles south. The 40-degree air and presence of plants and even birds was a little shocking – it felt positively verdant after the sterile whiteness of Ellesmere Island (Although in a few months, even Ellesmere will come alive for its brief summer). Occasionally a caribou raised its head to watch us pass. Eventually we reached the Russel glacier, a tongue of the vast Greenland ice sheet. This glacier is the easiest one to reach from Kanger, and is much visited by scientists. In the spring and summer, the glacier’s melt-water combines with similar runoff from other ice to create a river, which is visible in the foreground. The Glacier is too large to be seen in its entirety from the ground; what is pictured here is only a tiny part of it. Of interest to this science team, though, was the water issuing from the glacier. Glaciers slide on a layer of water that comes from melting as the warmer season advances, and also water that melts from the enormous press of the glacier’s weight. The water seeps out from a multitude of crevices, but is concentrated in certain areas, where you can see it pouring out, as if from an open fire hydrant. Underneath the glacier, within this layer of water, life is present. Microorganisms cling to the rock surface and to the underside of the ice, and they excrete compounds that change the chemistry of the rock. Evidence of their activity is also present in the meltwater. The team needs to collect this water every week or so to examine the changes in water chemistry as the summer goes on. 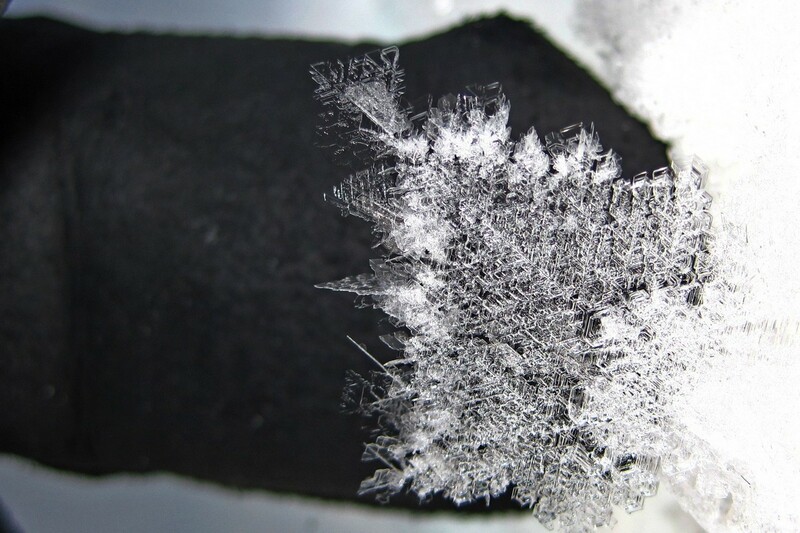 It is possible to work backwards from the chemical makeup of the water and arrive at conclusions about the bacterial activity going on underneath the glacier. However, as the summer goes on and more and more water comes out of the ice sheet, the river in front of the glacier will turn into a raging torrent which would be dangerous to cross. The scientists need a way to get across the river without endangering themselves. It’s not only the water they need to worry about; huge chunks of glacier occasionally fall off and plunge to the ground (this is known as “glacial bombardment”). These ice chunks are big enough to crush an apartment building, so you really don’t want to be near them when they go. It’s important to minimize time spent underneath its crumbling face. In the next image you can see the result of a glacial bombardment; to the lower left, one of the team stands on the beach. In between the ice rubble and the person, the glacial outflow is visible as a waterfall that flows into the river. The solution was to attach a steel cable to rocks on the riverside, tow it across the river using a boat, and then attach it to the glacier on the other side. Then, a hose was inserted into the meltwater outflow and run back to the other shore by suspending it from the cable. It was a nice piece of construction work that kept us busy all day long (actually, there is no night at this time, but you get the idea). After emplacing the cable and tubing, we collected ice samples using a chainsaw. Meanwhile, a team member put on ice spikes and climbed around on the glacier to collect ice cores using a hand-cranked corer. The glaciers have been grinding away at the landscape for million of years, producing every size of rock from house-sized boulders to microscopic sand grains that make quicksand – a real danger in the back country of Greenland (and all of it is back country!). Along the shores of countless creeks, rivers, lakes, and swamps, there is every variety of sand and gravel. It is not easy (or always possible) to tell just by looking at it if it’s firm or if it has the consistency of pudding. We had a great day, accomplishing our goals with no injuries. I felt so privileged to spend time in this environment and to experience it in ways that I’ve only dreamed about until now. In this journey, I have stood at the north pole – sea level, where it was 5F at its warmest, Greenland with its glaciers, the northeast US where it was hot and humid, the desert of Arizona, where it was close to 100F and dry, and finally – Flagstaff, at 7000 feet, where it was pleasantly cool and the scent of pines was once again in the air after a long winter. The trees, traffic, buildings and people were a shock to my system after almost a month spent amidst the stark beauty of the high arctic, where there was absolutely no sound and almost no sign of life. The kind of journey that I took in two days would have taken years in the very recent past, and in any group of people attempting to do it, not all would return. I have experienced one of the wonders of our age (long-distance travel) and played a small part in the effort to understand the way the planet works; I consider myself truly fortunate. 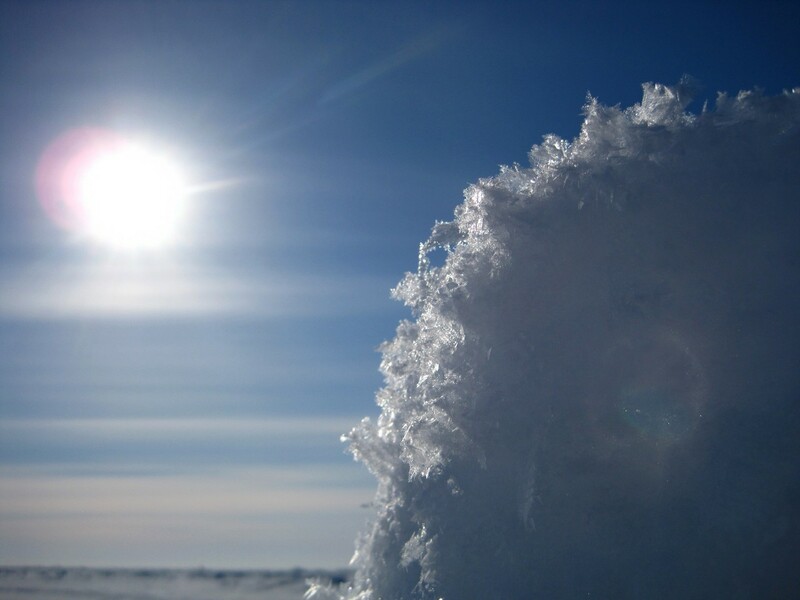 Well the time has come: we had a good run at Alert, collecting water and ice from 12 sites and meeting our objectives. Now it’s time to pack up those samples in coolers and pack it along with literally tons of our equipment. Everything is carefully packed away in cushioned plastic cases, wooden crates, cylinders, jugs, jars, pipes, and every conceivable shape and type of container. It is then all stacked on special pallets and netted down. This is hard work, and as the piles get larger, we have to lift the heavy cases to the top. Soon, the C-130 roars in from the snow clouds which almost cancelled the flight. Shortly thereafter, the giant fork lift loads the plane up and we take off for Greenland. I thought this sign on one of the rear doors was amusing. This pretty much covers all situations, doesn’t it? The C-130 doesn’t land on water. In a few hours, we see the broken-up ice that lies farther south. Then, the rugged coast of Greenland comes into view. He was just doing his job – patrolling for interesting possibilities, but I yelled and stamped at him and he went away. Earlier, I’d had breakfast with the quarry crew, who are making gravel to augment the runway here. Wolves hang out in the quarry area more than anywhere else because of the activity and the proximity of the garbage dump, where trash is burned using old cooking grease as an accelerant. So, the quarry crew is intimately familiar with the wolves, having named each one of them and recognizing them by sight. They told me that the animals will approach from behind and experimentally nibble on people’s legs and hands, but a good kick will make them understand that it’s not going to work. They are not afraid of the wolves, but understand that they must be wary of them. In the past 72 hours I’ve had a few encounters that made me feel the same way. here are a couple of wolves next to the burning conatiner. There is a discarded mattress lying there that seems to be a favorite hangout, and I bet it’s warm when the trash is burned! Some colleagues from Environment Canada were collecting samples from a freshwater lake near Alert, and their auger got stuck within the 3-meter ice. Since we were not able to fly due to weather, we pulled out our spare power auger, loaded up some snowmobiles, and headed out to try to help them. This was the first time I’d driven a snowmobile, and I found it exhilirating! It reminded me of a motorcycle. 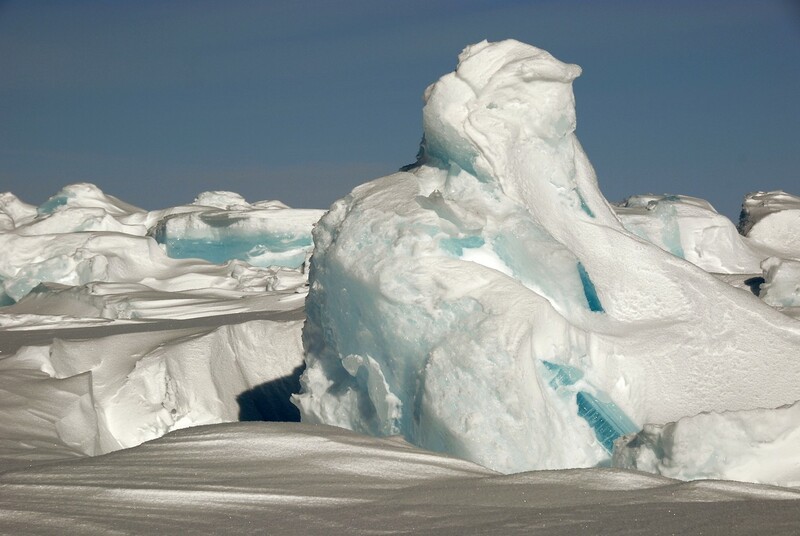 Freshwater ice is much denser than sea ice; if sea ice can be compared to sandstone, lake ice is like granite. It may have been years since this lake ice was last melted. Our auger, which was designed for the softer stuff, spun uselessly. We gave up and had time to visit our friends at another site, where a second ice auger had also become frozen. Those things are going to be there for the duration; they’ll try using a hot water melter to get at them, or possibly just tie floats to them and get them some other year when the ice has melted. Yesterday we flew by the north coast of Greenland. But in this location north of Greenland, ocean currents had broken up the ice surface. It was full of leads, rough unlandable ice fields, and fragile new ice. Eventually we found some better-looking ice and performed our last two sample collections before coming back to Alert for the last time this season. There were some fantastic, mind-bending blue colors in the ice. Here is a collection of shots taken from the air while traversing to and from our sample locations. We always start and end the flights by crossing the rugged and formidable north coast of Ellesmere Island. Most of these pictures are from the Cape Columbia area – one of the most northerly pieces of land on the planet, it cedes first place to other northerly locations by only a trivial distance. It is a place of precipitous cliffs, glaciers, and perpetual snow. Many explorers have lost their lives here, and nature does not give much of a break to the animals or plants either. Everything must do its best to survive and the devil will take the hindmost! In the next few images you can see the shore in the foreground. The Challenger mountain range comes right up to the sea, often with dramatic cliffs plunging directly into the water. 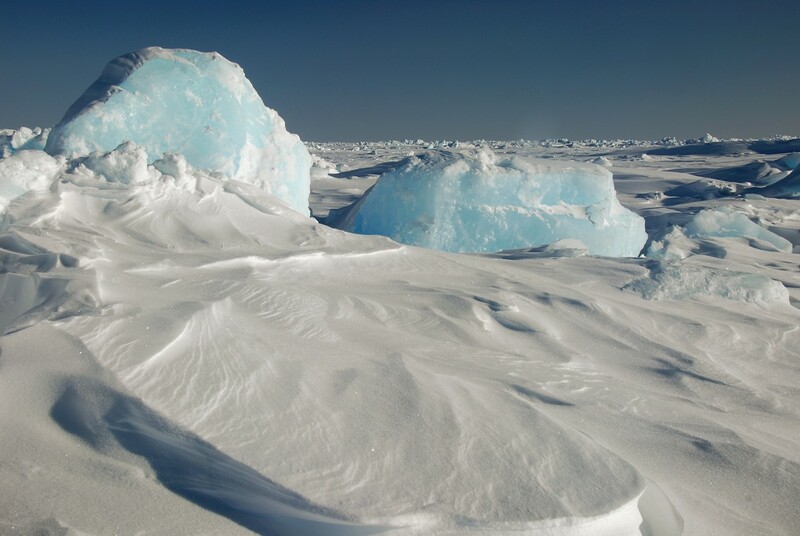 Now you’ll see the ice from a Marine-Terminating Glacier – a Glacier that spills directly into the sea and floats upon it, forming a flat shelf of fresh-water, glacial ice over the water, rather than the very different ice that is so characteristic of the Arctic icecap. 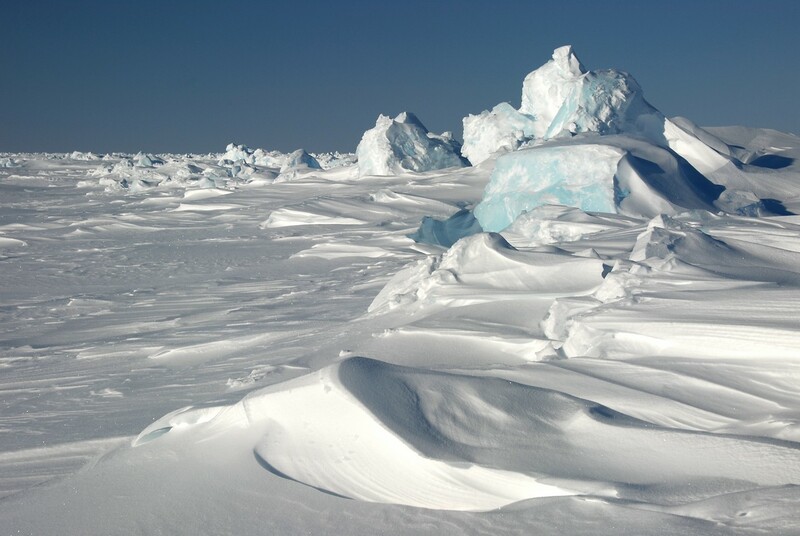 This fresh-water ice, being of a different density than sea ice, floats higher; when the sea (in this case, an inlet of a Fjord) freezes, there is a characteristic pattern of glacial shards on a flat plain of sea ice. 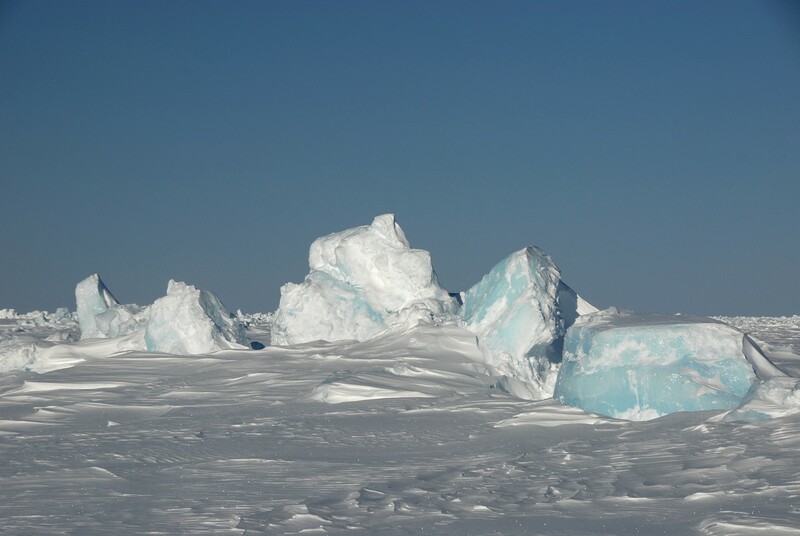 This is probably Yelverton or McClintock Bay – I can’t recall – west of the Ward Hunt Ice Shelf. Most of our sampling locations are out of sight of land, but here is the view from one of those close to shore. Traveling to the North Pole, Part 6: Wolves! I’ve been looking for wolves whenever I have had a free moment, and have finally seen some! They were down by a shipping container that is used to contain cardboard fires (which is how cardboard is disposed of). The disposal people use old cooking oil to get the fires started, and the wolves like the smell; I’d been told they often hang out near the container. For the last two weeks, although I’d seen their tracks, I’d not seen the animals. First one came out to investigate my footsteps, then another, and another, and another. To my surprise, the first one was bold and trotted right towards me. It got so close, I had problems focusing on it. I knew that I first had to pay attention to the situation at hand, and worry about photos later, because it wasn’t happening the way I wanted. Anticipating a distant viewing, I was carrying a monster 400 MM lens, and wasn’t at all prepared for the more initimate circumstances presented by this animal. While it came to within 6 feet of me, another one slipped behind a rise and started to flank me. “Oh no you don’t” I thought, and started to casually back up. Bold guy followed me, but the one behind the ridge eventually came back into sight, and not in the scariest location – behind me – that I had worried about. Eventually, when it realized I wasn’t going to give it any food – or whatever it was expecting – bold guy flopped down and huffed, just like my dog. I wasn’t comfortable being surrounded by a pack of wolves, so I kept moving away. They followed me for a couple of hundred yards, but at a more respectable distance than the first encounter. Every time I stopped, they stopped. Every time I moved, they moved. I took a few pictures but was uncertain of how to handle the situation; I wanted to get more shots of the wolves interacting but every time I showed interest, they came closer. It wasn’t really what I wanted, because I had no nearby shelter. To my knowledge, they’ve never attacked a person here, but I’ve heard stories about people’s hands being nibbled. How dangerous are these particular guys, anyway? Eventually, they all lay down and started howling. It sounded just like my dog! Other, unseen wolves returned the howl. After a while, they all got up and walked out of sight, sometimes playing with each other and bounding in a recognizable play attitude, as at a dog park. I am not fooled by appearances though – these are wild animals – and I was both glad that they were away and dissapointed that I didn’t get to observe them longer. I promised that I would reveal what we do in the tent on the side of the airplane. It’s no big secret; I was just waiting for the opportunity to get the right images. ice types converge into this region and are sent on their way <…>. this region to achieve both understanding and a predictive capability. Specifically, I am supporting the hydrochemical section of the project. The “hydro section” is run by the Lamont-Doherty Earth Observatory, which is part of Columbia University in New York. I work for Johns Hopkins University’s Applied Physics Laboratory, which is collaborating with LDEO on a new data-collection buoy for which I’ve written the firmware. I’m also responsible for fielding it, repairing it, and generally tending to it during this field test. I am also assisting LDEO in the deployment of the hydrochemical sample collection equipment. This water is draining into the north Atlantic. What does this mean? 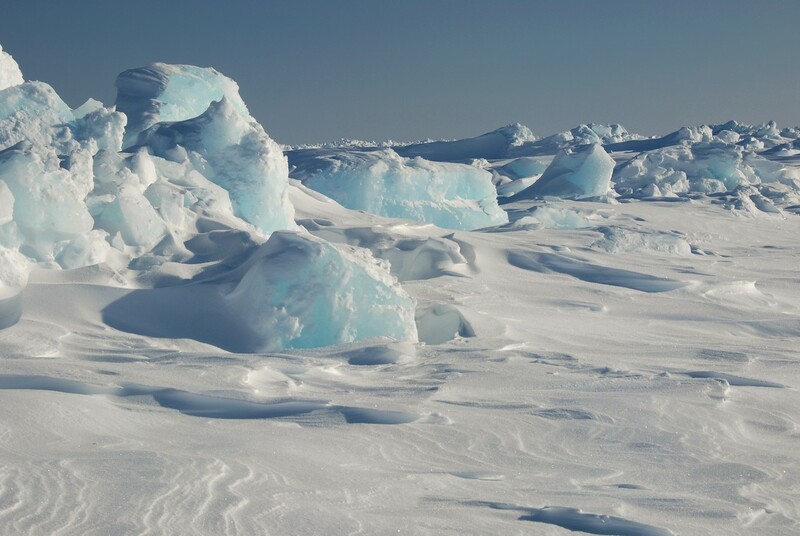 The north polar ice cap is melting more than it used to – it’s warming up; in the next few decades, perhaps within my lifetime, it could be that in the summer, at least, there would be no (or little) ice at the north pole. University of Washington oceanographer Mike Steele gave a talk to station personnel during one of our non-flight “weather” days here, and an audience member asked “How do you know that global warming wouldn’t be happening naturally, despite human influences?” This is a good question and an understandable one. My answer is to compare it to smoking: we are all mortal, but those of us who smoke are, on average, aging faster and with forseeable illnesses. It is absurd to maintain that smoking does not affect health, even if you can’t predict with precision exactly how it will effect a specific individual. It is like this with the planet: it is unlikely that the warming we are observing is not being accelerated – or caused outright – by people. Look at it another way: mass extinction by bombardment from outer space is a natural, recurring phenomenon. However, that doesn’t mean that we should not be concerned about such things happening naturally, or that we should start pushing asteroids into the earth. I’m pretty sure that if someone were to try pushing one down, the rest of us would try to stop them from doing it, and if we knew one was coming naturally, we would also try to stop it. The fact that something occurs naturally is irrelevant to a discussion of safety; rattlesnake bites, lightning, and broken hips in the elderly are also natural, yet we still try to avoid them. So to anyone who questions the global warming phenomenon, I say that yes, there is uncertainty about why it’s happening, how fast, and what effects it will ultimately have – just like drinking, smoking, getting hit by lightening, or driving without a seat belt – all of which also may not kill you. There is no reasonable debate about the fact that global warming is occurring and that the things people are doing to the planet are the kinds of things that will make this change happen faster than is natural. Now that my rant is complete… The pictures of the hydrochemical sectioning process. We fly a twin otter aircraft from the airfield at Alert, and based upon the weather, choose to go to one of ten locations on a line from here to the pole. The same ten locations are sampled every year. We pull hundreds of pounds of equipment out of the plane, assemble a gas-powered ice auger, and drill a hole in the ice. If there is deep snow on the ice, we have to shovel it out of the way first. As the chips come out of the hole, some of us work with shovels to keep the hole clear. Every so often, we must pause and attach another flight (section) of ice auger bit in order to get deeper. Eventually the auger punches through the bottom, and water momentarily gushes up through the hole. the water has a startling azure color to it, like the tropics. We then set up a tent around the hole and start up a heater to make it possible to work comfortably inside. The sampler has 12 bottles, arranged in groups of 4 within “cassettes.” The cassettes are manually stacked on top of each other and fasted together to make a torpedo-like package that is lowered through the hole using a winch. As the last cassette is placed, the assembly is lowered to depth – usually about 500 meters or so. Using another hole drilled a short distance away, I was able to use my scuba camera on a pole to get these shots of the package coming through the bottom of the ice. The ice in this location was about 5 feet thick. Here is some video showing the process, with interesting views under the ice. As the assembly glides down into the water, instrumentation returns values for depth, conductivity, and temperature. On the way back up, where there are “interesting” features in these measurements, a computer command is sent ordering one of the sample bottles to close, collecting water from that depth. Within the tent on the top of the ice, one of us operates the computer, and one or two of us manhandle the winch and cassettes as they go down and come back up. When they return, they are pretty heavy! We have to lift them into the plane, where they are stored in coolers until we return to the lab at Alert. Once there, scientists will perform measurements on some of the water, and package the remainder for analysis back at LDEO. Meanwhile, we’ve drilled another hole outside and, using the most high-tech methods available, lowered a bottom sounder below the ice. Today we worked close to the magnetic north pole. I should explain that there are two north poles; the “true” (or “geodetic”) one that is found at the “top” of the world where lines of longitude meet, and the magnetic one, which is the attractor for all “north” magnet ends on the earth. 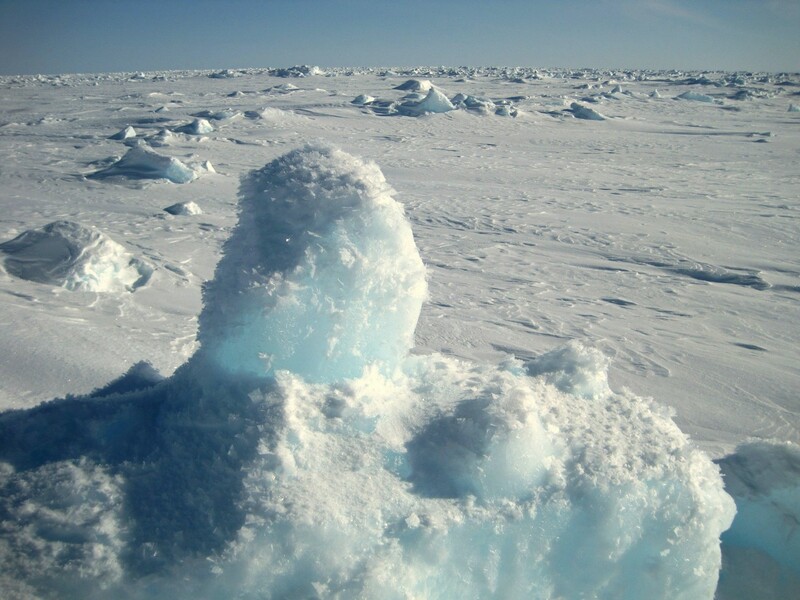 The geodetic pole is fixed; it never moves and can be thought of as sitting on the floor of the Arctic ocean, covered by ocean and surrounded by a surface icecap. The magnetic one wanders; in my lifetime it has moved hundreds of miles. The magnetic north pole is currently south-west of the geodetic north pole, off the coast of arctic Canada, and is moving towards Russia. 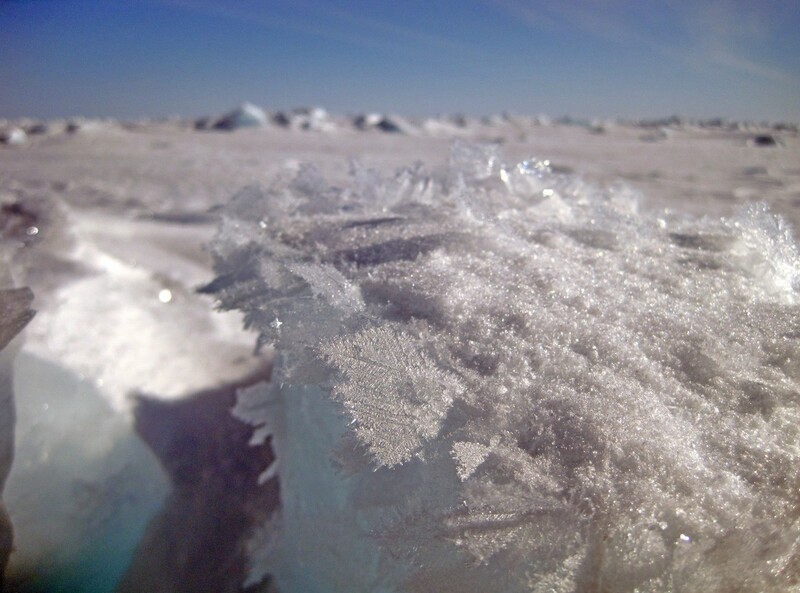 There was a lot of beautiful ice there covered with hoarfrost, and occasional startling blue patches that must be seen to believed. We met our science goals and left, having visited the region for only a couple of hours. We were not right on top of the pole, but close enough that my compasses didn’t agree, and didn’t always return to the same place; they seemed confused. It is this way for miles in every direction. I tried using my map navigation compass, my wrist compass, and my iphone; none of them agreed in the slightest. A compass that was spun or shaken would not go back to a fixed point, but would wander around, occasionally finding renewed vigor in pointing to a random spot for a while. 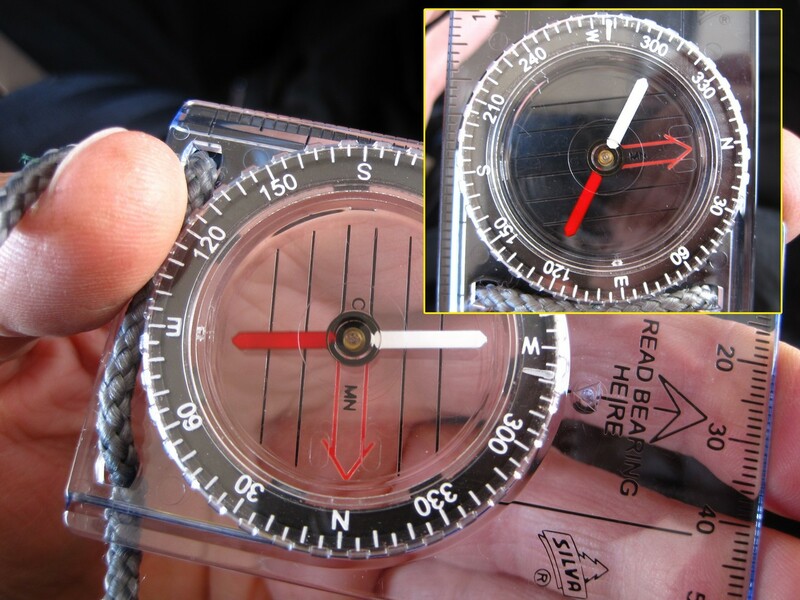 As you can see from the image, a compass turned does not re-orient to magnetic north. I took the pictures from the same orientation.